Posted on July 28, 2017 , in Hot Tubs. Energy efficient hot tubs are among the most popular options on the market. Not only will they help you save on your electric bills, but they are healthy for the environment. Below you’ll learn about environmentally friendly hot tubs and what to look for to choose the right one for you. What is an Eco Hot Tub? An eco hot tub is another name for an energy efficient model. These hot tubs, also sometimes referred to as low impact hot tubs, are constructed with eco-friendly materials and methods. They also have features and components that are designed especially to save energy as well as energy-saving settings. The pump, filter, heater, shell construction, insulation, and cover are all essential to energy savings. Surprisingly, two-pump hot tubs save more energy than two-speed pumps. This is because a single pump circulates the water while a second pump is used for the jet system. Because you only need to turn on the jet pump when you’re using the hot tub, having two pumps will save you a lot on energy. Even when you aren’t using your hot tub, you’re paying to heat it, so you’ll want to turn down the temperature when you aren’t using it. But many eco-friendly hot tubs make this even easier by offering economy mode settings that will turn down the heat for you when the hot tub isn’t in use. A hot tub that can reuse the heat exhaust from the pump to heat the water will save you even more energy as you won’t have to run the heater as often. Finally, you can reduce the temperature by several degrees to reduce your electrical bill. Use the programmable thermostat to adjust the heat for different times of day. The insulation and exterior materials are extremely important to energy efficiency. A hot tub that is fully (rather than partially) insulated with high-density polyurethane foam will keep heat in the hot tub. Also invest in a sealed, locking cover. It will keep heat from escaping from small cracks between the cover and the hot tub. 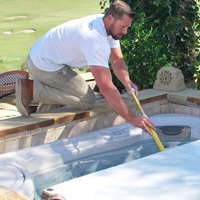 Now that you have some ideas about what to look for in an energy efficient hot tub, download our buyer’s guide to start investigating the best energy savings options for your household.